I suffer from dry lips and it drives me mad! I am always searching for good lip moisturizers or exfoliants. When i was in Lush the other day i noticed 'BubbleGum Lip Scrub' by the till, gave it a sniff and had to buy it! It smells gorgeous, it's hard to resist a lick when you put it on :D And guess what it smells of......SNOW FAIRY! Lush's most popular scent. Made from basically sugar and some jojoba oil, you just rub it in your lips, wipe it off and your left with a smoother pout! I love it! I bought another 'King Of Skin'! I love this body butter, although it goes way too quickly! You rub it on while in the shower and it instantly moisturises your skin. So you don't have to worry about putting any on after your shower, which i can never be bothered to do. When applied it almost 'greases' your skin (but to the baby oil extent! ), it is super moisturizing. This is one product that i always re-purchase. It's full of cocoa butter, shea butter, coconut butter, bananas, toning essential oils, jojoba and almond oils, fresh avocado and oatmeal. I highly recommend this! I did mainly just buy massage bars and Body Butters this time, as they really are my favorite product from Lush. I just wish they lasted longer! I decided to try 'Strawberry Feels Forever', anything that leaves the scent of strawberries is a winner for me. It's lovely and creamy and leaves your skin nice and soft, 'King Of Skin' is still the best for moisturizing, although this one does leave a nicer scent. I did forget that i already had 'Aqua Mirabilis', but another one won't hurt! I'm really bad for remembering to exfoliate, mainly because it hurts so much with the brush I use - I never want to...so this body butter is great. 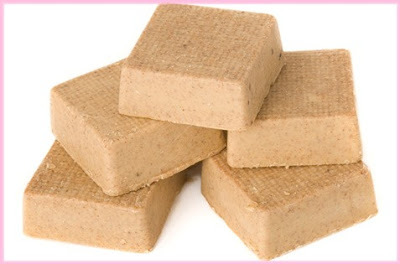 It has tiny ground almond shells which exfoliate your skin, and leave it very soft. I use this once a week. 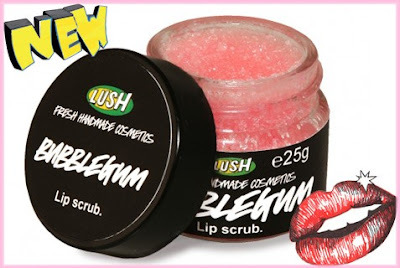 I love the look of the bubblegum lip scrub sounds yummy, Your page is soo pretty, i love it. The strawberry one is my favourite of all of them, so yummy you smell like a milkshake! I really want the Bubblegum lip scrub! 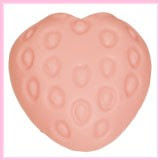 I am a big fan of strawberry scents as well, I may have to order a few things online since I don't have a Lush near me...I love the idea of moisturizing your body while still in the shower! I bought the bubblegum lip scrub a week or so ago, its smells amazing, but mine is a little too dry, I need to wet my finger to be able to spread it! I mentioned this to the SA when I was buying some more Lush goodies on Saturday and she told me to bring it in and she will swap it for a new one, how nice is that??!! 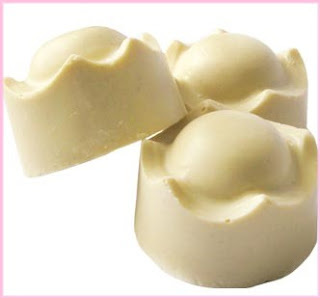 I also love the Mango bath melt, it makes me want to be on holiday whenever I use it!! a: i love the lip scrub. i also suffer from dry lips, and i should invest in some scrub. thanks for this. b: for Juliana--i use a face wash, toner and moisturizer in that order. that is my routine in the morning. i use a face wash, toner and then a lotion before bed. Where can I find LUSH products?? I'm super interested in trying The King of Skin! I NEED TO TRY KING OF SKIN! I ALWAYS FORGET TO PUT LOTION ON! YOU ARE THE FIRST PERSON I HAVE HEARD DO A REVIEW ON THIS. THANK YOU!